A primer on the scope of the Implant Files investigation, its broad findings, and the rules governing the medical devices industry in India. What is the Implants Files investigation? It is a global examination of the medical device industry and its overseers. The International Consortium of International Journalists (ICIJ) and a team of more than 250 reporters and data specialists from 58 news organisations in 36 countries examined hundreds of cases to investigate various aspects of the medical device industry — regulation, faulty devices and corruption. The ICIJ and its partners filed more than 1,500 public records requests and collected more than 8 million device-related records, including recall notices, safety warnings, legal documents and corporate financial filings. 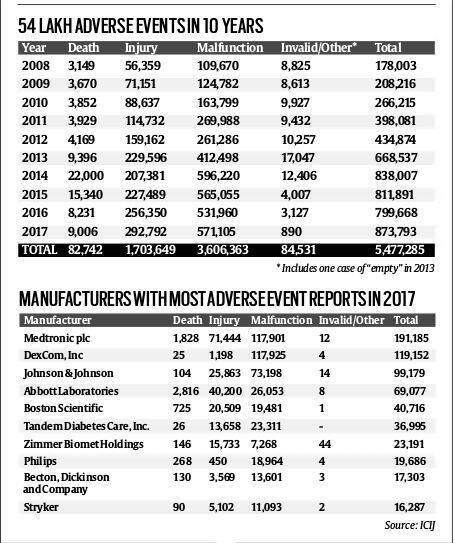 More than 5.4 million “adverse event” reports sent by various countries to the US Food and Drug Administration (FDA) over the last decade make up the greatest share. What are its main findings? First, that governments in dozens of countries in Africa, South America and Asia don’t regulate medical devices, instead placing their trust in European authorities or in the US FDA. Second, medical devices that broke, misfired, corroded, ruptured or otherwise malfunctioned after implantation or use — despite assurances by regulators, the industry and doctors that they were safe — were linked to 1.7 million injuries and nearly 83,000 deaths over the last decade. Nearly 5,00,000 reports mentioned an explant — a surgery to remove a device — in connection with an adverse event. Third, that doctors and manufacturers often fail to report adverse events, and when they do the information can be unverified and incomplete. What is a medical device, and to what extent are these regulated in India? India’s regulator Central Drugs Standard Control Organisation (CDSCO) broadly defines a medical device as any “instrument, apparatus, appliance, software, material, or other article” that is to be used, whether alone or in combination, for “diagnostic or therapeutic purposes”. Earlier, only 10 notified medical devices were regulated in India. This has since been broadened to 23 categories of devices. These mainly include syringes, needles, perfusion sets, in vitro devices for HIV treatment, catheters, intra-ocular lenses, cannulas, bone cements, heart valves, orthopaedic implants, coronary stents, IUDs and condoms. How big is the market for medical devices in India? According to industry estimates cited on the Make in India website, the industry in India is currently valued at $5.2 billion and contributes 4-5% to the $96.7 billion Indian health care industry. The Indian medical device market is expected grow to $50 billion by 2025. Currently, India is the fourth largest medical devices market in Asia after Japan, China and South Korea. Equipment and instruments constitute nearly 54% of the medical devices in the market; the other important segments are consumables and disposables that are mostly manufactured by Indian player, patients aids like hearing aids and pacemakers, various implants, and stents. What are the laws governing medical devices in India? In India, medical devices continue to be regulated as “drugs” via the Drugs and Cosmetics Act, 1940, and that newly introduced Medical Device Rules, 2017, which came into effect on January 1, 2018. New rules classify medical devices based on risk, as is done by the Global Harmonisation Task Force. The devices are classified as Class A (low risk), Class B (low moderate risk), Class C (moderate high risk) and Class D (high risk). An application for grant of a licence to manufacture Class A medical devices does not require prior audit by third party or official inspection; Class B medical devices require prior audit by a third party but do not require official inspection; Class C or Class D medical devices require prior official inspection. Who governs pricing of medical devices and implants in India? And which devices/implants are now under a price regulation? The National Pharmaceutical Pricing Authority of India (NNPA) monitors the prices of medical devices. The NPPA’s Drug Price Control Orders (DPCO) 2013 apply only to medical devices. Out of 23 medical devices listed as drugs, four — cardiac stents, drug eluting stents, condoms and intra-uterine devices — have been included in the National List of Essential Medicines and are under price control by virtue of being included in Schedule-I to DPCO 2013; their ceiling prices have been fixed. The government has also notified ceiling prices for orthopedic knee implants in DPCO 2013. The maximum retail prices of other medical devices, being under the non-scheduled category, are monitored by the NPPA to ensure that no manufacturer increases the MRP by more than 10% of the price during the preceding 12-month period. Why does a device such as a pacemaker, for instance, cost less in the market and much more when implanted in a hospital? This has to be understood through a number of stages. If the pacemaker is imported in India, then the subsidiary pays its parent company the import cost. For instance, a US-based company buys an ‘X’ pacemaker for Rs 25,000. The Indian subsidiary then increases the price, fixes the MRP at Rs 50,000, and then sells it to a distributor at a “discounted price”, say Rs 46,000. The distributor then sells it to a hospital at a price that is still discounted compared to the MRP, say at Rs 48,000. Finally, the patient buys the device from the hospital at Rs 50,000. So within the chain, all three make a profit. Additionally, the patient pays the cost of the surgery, which varies from hospital to hospital. What is the redress mechanism for a patient if a device/implant turns out faulty? Currently, there are no specific rules or a law that allows the government to direct a medical device company to give compensation to a victim after the device has been found faulty. Following the emergence of faulty hip implants from Johnson & Johnson, the Ministry of Health and Family Welfare is working on a formula for compensation. There are proposals that the government might include a special clause under the Medical Device Rules to include compensation for patients. But the patient can always approach a consumer court to seek damages from the device company. What are the basic things that a patient should ask the surgeon before getting an implant? First, a patient should ask a doctor if he/she has an authorised licence to conduct the implantation. For instance, a doctor in Delhi must posses a valid Delhi Medical Council (DMC) licence to perform a surgery in the capital. Because, if there is a case of negligence, only the DMC has the jurisdiction to investigate a surgery that has taken place in the capital. Second, the patient has ask which particular device is being implanted, and if the device has received approval from the regulator for commercial use. Third, the patient should ask to know the risks, both long-term and short-term, which are involved in the implantation. Certain devices can contain materials that are not recommended for a certain group. For instance, a hip implant with a metal covering is not advised for a pregnant woman; the metal debris can cause adverse reaction to both the woman and the child. Fourth, the patient has to ask the doctor where he/she should report if they experience an adverse reaction caused by the implantation. Fifth, the patient should ask the doctor/hospital to submit all documents – model number, batch number of all components of the device implanted in the body. This is the most important piece of information that is required, if one has to later seek action against the company for an implant found to be faulty.